No doubt you’ve heard that adage that warns us to be careful what we wish for? Well my work had hit a low spot, probably due to the holidays, so I decided it was time to begin work on the John’s Armoire project I’ve had a few blogs about. After drawing the plans up and driving to Woodworkers Source in Arizona work began on this project. Work that is designed to stretch my abilities which is something I always want. If you’ve been following the blog you know the progress that I’ve made. Towards the end of December I accepted two other commissions, both of which are fairly large so the shop would be pretty crowded if I attempted to work on all of them at the same time. Luckily, they need parts that are outsourced so I should be able to space the work out — self discipline will be required. One of these projects is a media stand that will feature a top and drawer section made of reclaimed fence boards. I just received the metal legs for them this evening so now it’s time to start work on this project. I will blog it as work progresses. The other project is for sideboard with a hidden liquor compartment. 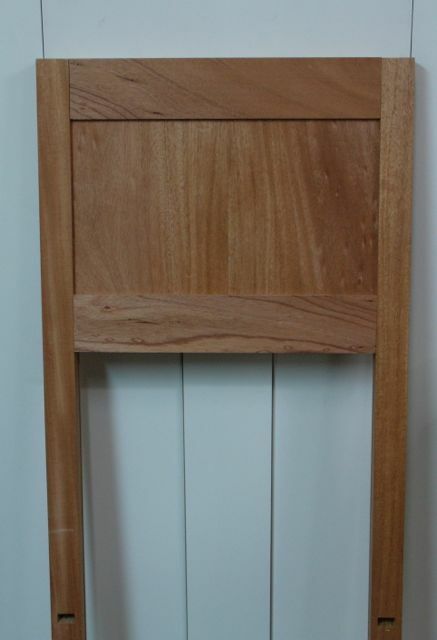 It will be made of Bubinga which I ordered from Woodworkers Source in Arizona. The shipping shows it should arrive by the end of the week but the heart of this project is an appliance lift manufactured by Auton. It’s been ordered and should be here in about 2 more weeks. So that leaves me with a day to finish up what I can on the Armoire until it needs to be put aside for my paying customers. I chose to make this a final day to work on the Armoire. You may recall that it is made of Genuine Mahogany and I purchased all 8/4 material so I could resaw and build up the panels. These panels are about 3/8″ thick and since they’re 16+ inches wide will require flattening with the use of hand planes only. That’s okay with me because incorporating hand planed surfaces is a feature of my furniture. You know too, that I’ve recently experimented with adding video’s to this blog. Thought this might be a good time to see how that works out so please, let me know your thoughts. After setting up the camera on a tripod, the first panel I’ll attempt is the one that goes on the middle section. It only measures 9 7/16″ x 16 1/4″ so is a good candidate for my first attempt at working this Genuine Mahogany. These are only 3/8″ in thickness so flattening may be the wrong word to use, they’ll probably always have a bit of curvature to them but since they fit into a 1/4″ wide by 5/16″ deep dado they should be fine. Dry Fit, Loving the Wood! Of course, now I had to do a trial fit to see how the panel looks after rabbeting the back of it to fit into the groove. As I suspected, there is a “wave” to the panel but it’s easy enough to fit into the groove. I’ll cut a slight chamfer on the tongue part of the panel to make glue up as stress free as possible. 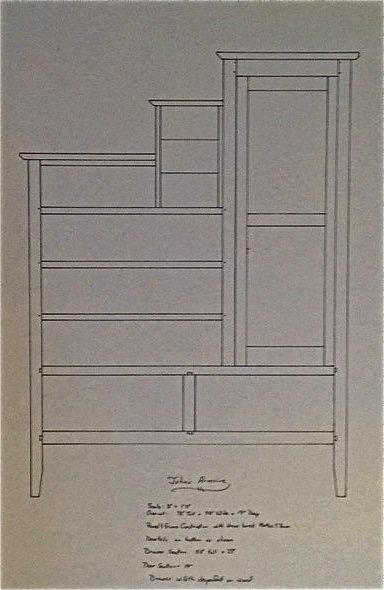 Refer to the plan at the beginning of this blog, this is the center section of the Armoire. You may notice the mortises at the bottom of this picture for the drawer stretchers. The top of the small drawers fits into the bottom of the stretcher in this photo. Can’t hardly wait to begin assembly and oiling of this piece but paying customers always come first! This entry was posted in Hand Planes, Hand Tool Woodworking, Johns Armoire and tagged Furniture design, Genuine Mahogany, hand plane use, John's Armoire, Lie-Nielsen Jack Plane, Lie-Nielsen Smooth Planne, smoothing panels, YouTube Video. Bookmark the permalink. 2 Responses to So Many Projects — Thank Goodness, Plenty of Time! I’m going to be in In Las Vegas attending the KBIS Show this week, let me know if you have any free time. Not planning to go to the show but would like to meet you there and have a cup of coffee. I imagine you’ll be working but as I recall there’s a coffee place in the convention center where even non-attendee’s can go. If you locate that and have some time give me a call or text. I’m pretty flexible so let me know what works — as you saw I’ve got a number of projects going on!